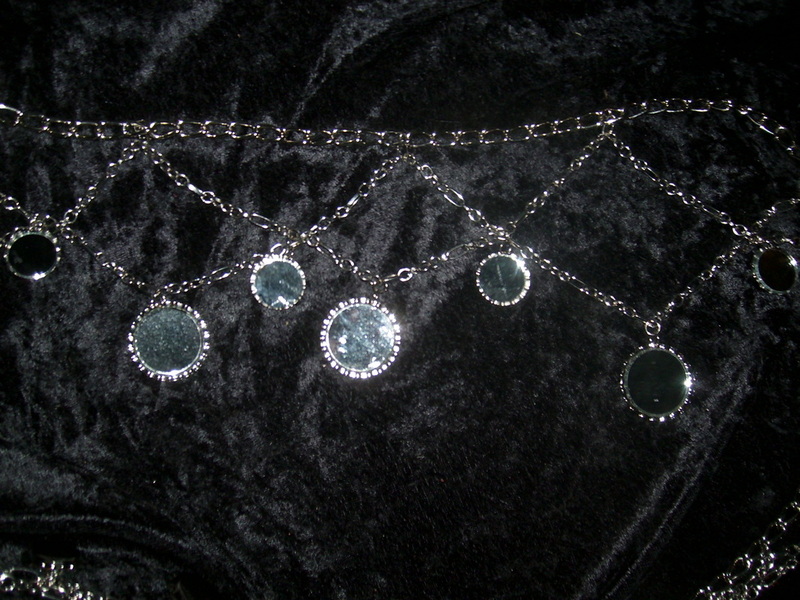 A small section of a finished belt, showing the loops and mirror dangles. Connect 12" of fine chain to one end of the heavy chain. Connect your decorative dangle to the end of the fine chain and your large clasp to the end of the heavy chain. You are going to end up with the number of loops that you have of a given size of dangles. So if you have 12 large dangles you will have 12 loops. If you have 14 large dangles you will have 14 loops. Half the loops extend from the clasp to the point where the fine chain connects to the heavy chain (your hip measurement). Divide hips+12 by half the number of dangles to get how much chain each loop uses. (48+12)/6 = 10" of chain per loop. Divide hips by half the number of dangles to get how far along the base chain the loops connect. 48/6 = 8" of run along the base chain. Starting at the clasp connect the fine chain to the heavy chain with a jump ring. Measure your loop length of the fine chain and the run of the heavy chain and then connect with a jump ring. Repeat until you reach the place where the dangle chain connects to the base chain. Starting at the center of your first loop (so 4" from the clasp using the 48" hip example) repeat for another row of loops over the top of the first row, but offset. Leave one loops length free at the end of this run and attach the small clasp to it. Measure the half way point for all loops and attach a large dangle using a jump ring (using this example that would be at 5" along each loop). Use a jump ring to connect a small dangle at each place that the two loops cross (I hung mine up to make this easier). You will have a small dangle on the loose chain half way between the large dangle and the small clasp.